The fourteenth round of Monster Energy AMA Supercross, an FIM World Championship was a major game changer for points leaders across the board as 54,703 fans in attendance at Nissan Stadium were brought to their feet as Kawasaki swept the podium in both classes at the inaugural visit to the state of Tennessee. 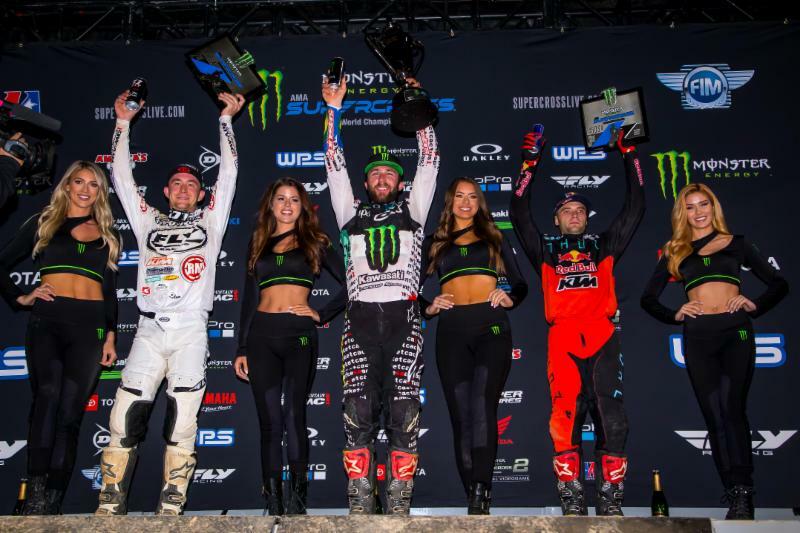 Monster Energy Kawasaki’s Eli Tomac rode flawlessly to earn his fourth win of the season while Monster Energy Pro Circuit Kawasaki’s Martin Davalos also collected his first win of the 2019 Eastern Regional 250SX class season. Red Bull KTM’s Cooper Webb snagged the holeshot in the 450SX Class Main Event and catapulted to the front while teammate Marvin Musquin caught up for a short-lived battle before entering a rut in the whoops crooked which shot him off the track, causing him to fall to the back of the pack. This mistake left Webb untouched in the lead and allowed Monster Energy Kawasaki’s Joey Savatgy and Team Honda HRC’s Ken Roczen to slide into podium position. Savatgy then slid on the slick dirt which caused Roczen, the fastest 450SX Class Qualifier to get hooked in his rear wheel on the ground and crash over the berm onto the opposing section of track and into on-coming traffic; sending both Roczen and Savatgy out of podium positions and back to 21st and 22nd place respectively. 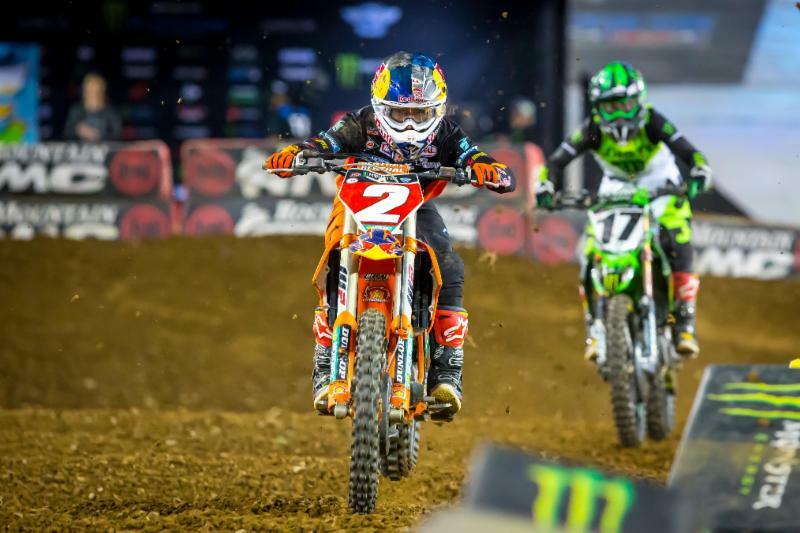 Red Bull KTM’s Cooper Webb out front after earning the holeshot in the 450SX Class Main Event at Nissan Stadium. Photo Credit: Feld Entertainment, Inc.
With more than half the race to go, Webb was passed by Tomac for the lead, where Tomac would stay for the remainder of the race. Team Rocky Mountain ATV/MC KTM WPS’ Blake Baggett followed in suit, battling Webb for the second-place step on the podium. Baggett advanced by passing Webb where he stayed for the remainder of the race. Last week’s third place finisher, Rockstar Energy Husqvarna’s Dean Wilson, stayed consistent with a respectable fourth place just off the podium. Musquin was able to get up after his crash and finish sixth while Roczen finished in eighth. Tomac’s win in Nashville has earned him enough points to now be tied with Musquin in the overall standings with 288 points, 21 points behind leader, Cooper Webb. 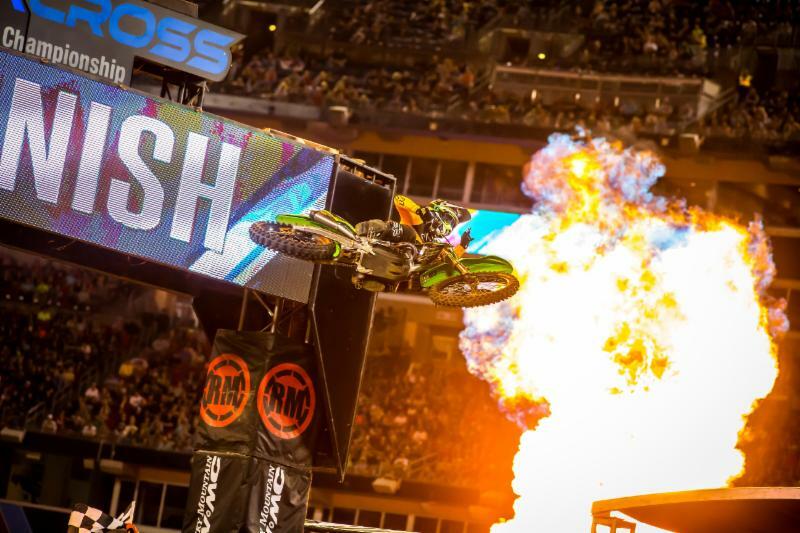 Tomac is the first rider since Ryan Dungey in February of 2013 to win the LCQ and the Main Event on the same night. When asked about his journey through the heat race where he obtained a DNF due to mechanical problems, to winning the LCQ, to winning the Main Event, Tomac explained, “I’m kind of at a loss for words right now, really. Qualifying was not so good today. I was a little behind and not my normal self. Then, was leading the Heat Race and don’t know what happened and went to the LCQ and got through that. I had some fortune with those crashes [Musquin and Roczen], but overall felt good through the whole Main and that’s the most important thing. Thanks to everyone for sticking together”. 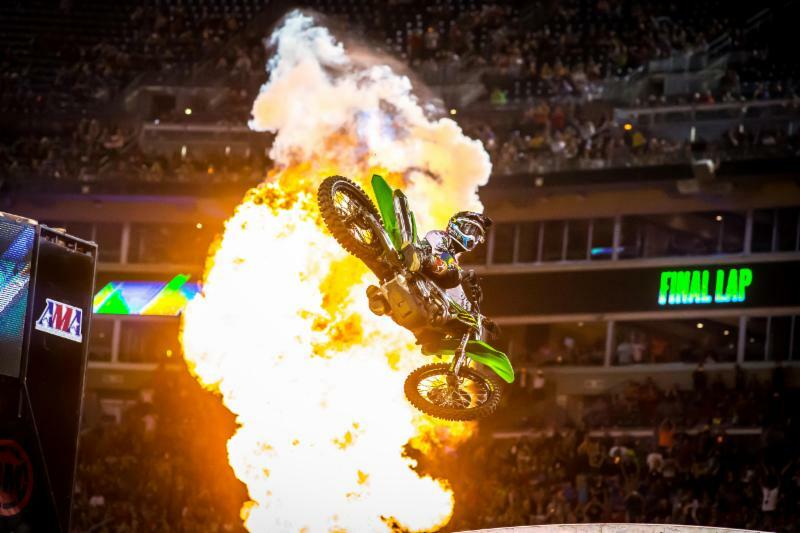 Monster Energy Kawasaki’s Eli Tomac wins his fourth 450SX Class Main Event of the season. 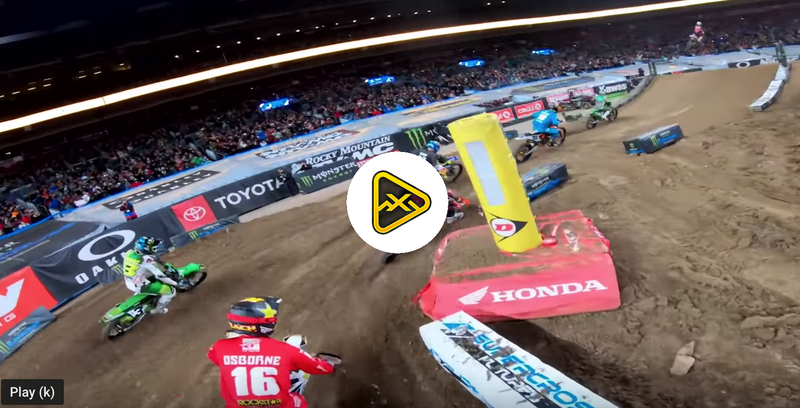 Photo Credit: Feld Entertainment, Inc.
After an injury in qualifying, the fastest 250SX Class qualifier, Monster Energy Pro Circuit Kawasaki’s Austin Forkner did not line up in his Heat Race, hoping to be able to go to the LCQ and ride to salvage his points in the Main Event. Unfortunately, Forkner was not able to race in the LCQ equaling no positive points for the leader. Monster Energy/Star Racing/Yamaha’s Justin Cooper shot off the Main Event gate hot, clinching the holeshot and was able to keep his lead for the First Lap until GEICO Honda’s Chase Sexton battled him for the lead spot. Sexton passed him, and Cooper fought back, taking both Sexton and himself down, allowing for Martin Davalos to take over the coveted top step of the podium; his first of the season and fifth of his career in his 99 starts. Sexton and Cooper climbed their way back up past Cycle Trader Rock River Yamaha’s Brandon Hartranft, JGRMX/Yoshimura Suzuki Factory Racing’s Kyle Peters, and TLD Red Bull KTM’s Mitchell Falk, settling in to 2nd and 3rd place respectively. Forkner’s absence tonight allowed for Sexton to close the 26-point gap between the two to a mere 3-point gap. Sexton, however, does not want to win due to fault, he wants to earn his place, explaining “It’s a bummer that Austin could not race tonight, I do not want to catch him in points that way. It is not the way I want it, but we are going to regroup and go back to work and come back swinging at MetLife. I’m coming for that win; I feel like tonight was mine and I got it taken away from me”. Monster Energy Pro Circuit Kawasaki’s Martin Davalos taking the checkered flag in his first win of the 2019 season. Photo Credit: Feld Entertainment, Inc.
Martin Davalos explained his trials the last few weeks by stating, “It has been a struggle, and a struggle, and a struggle to get back to where I belong… to be honest with you, I am capable of so much more… I have a lot of issues with my neck. I was put to sleep last Friday to deal with this issue and this was a huge win for me; I have not raced Supercross since Indianapolis, I have been taking care of my neck… but this win, the whole team deserves it”. With the close proximity to the St. Jude Children’s Research Hospital in Memphis, Tenn. and the season-long “THIS SHIRT SAVES LIVES” movement continuing, Nashville provided the perfect backdrop to host the first-ever “THIS RACE SAVES LIVES”event where several St. Jude patients and their families were treated to a night of Supercross where they watched all of the racing from a custom-built, on-track suite specifically designed for them to be as close to the action as possible. Athletes and teams adorned patient-inspired artwork on their race bikes, helmets and gear throughout the night, all of which was donated to an online auction which will kick off on Wednesday, April 10 and run through the final race in Las Vegas on May 4. Additional items fans can bid on include an Official 2017 Ryan Dungey Championship Replica Ring, a Bullfrog Spas Hot Tubcomplete with an autographed Smartop cover from the Smartop Bullfrog Spas Motoconcepts Honda team and more. Fans can visit SupercrossLIVE.com for additional details. 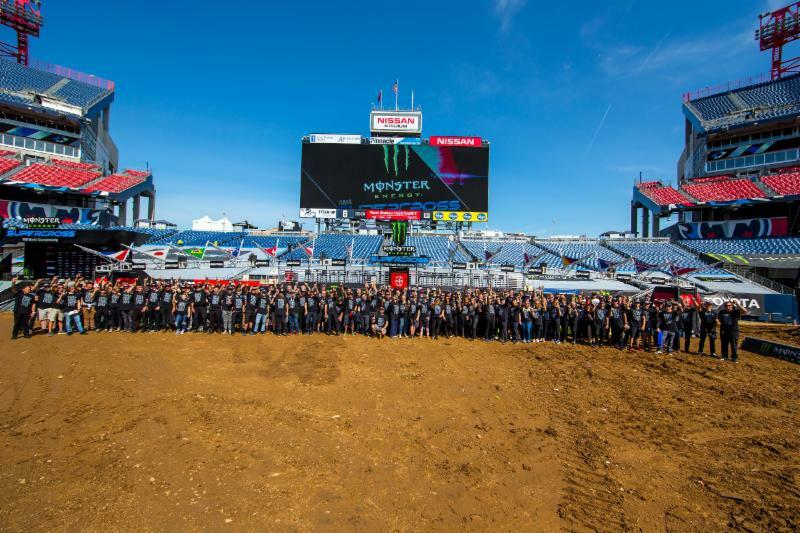 Prior to the Monster Energy Supercross race in Nashville, teams, athletes, celebrities and industry personnel posed for a photo adorning “This Shirt Saves Lives” T-shirts showing support for the children of St. Jude Children’s Research Hospital. The remaining three races will continue to be close battles that are full of suspense for not only the fans, but the riders and teams as well. 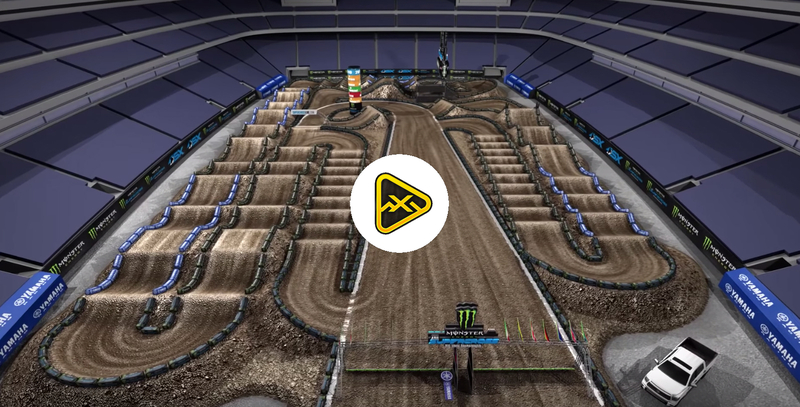 It will be interesting to see how this plays out next week as Monster Energy Supercross goes to Broncos Stadium at Mile High in Denver, Colorado.